New England Patriots tight end, Rob Gronkowski, has recently announced that he is retiring after nine seasons in the NFL. “It all started at 20 years old on stage at the NFL draft when my dream came true, and now here I am about to turn 30 in a few months with a decision I feel is the biggest of my life so far. I will be retiring from the game of football today,” he wrote. The 29-year-old made the announcement in a lengthy Instagram post where he reflected on the time he spent in a Patriots uniform. “It was truly an incredible honor to play for such a great established organization and able to come in to continue and contribute to keep building success. To all my current and past teammates, thank you for making each team every year special to be a part of. I will truly miss you guys.” Along with thanking his teammates, Gronkowski also expressed his gratitude toward team owner Robert Kraft, head coach Bill Belichick, and the Patriots fan base. Gronkowski was a huge success with the New England Patriots. The 6-foot-6 tight end was arguably the best at his position. His size combined with his skill made him nearly an unstoppable force throughout his career. Gronkowski has set multiple records for his position, including his 2011 season with 17 touchdown receptions, the most of any tight end in NFL history. He finished his career with many other impressive numbers as well. Gronkowski tallied up 521 receptions, 7,681 receiving yards, and 79 touchdowns over the course of his nine years in the NFL. While he was dominant on the field, he spent quite a bit of time off of it. Over the years, Gronkowski was sidelined with injuries to his back, ankle, hip, forearm, knee, and head. The star tight end was in the league for a total of 144 regular season games, and unfortunately he missed 29 of them due to injury. It had been rumored that the five-time Pro Bowler would be considering retirement this offseason. 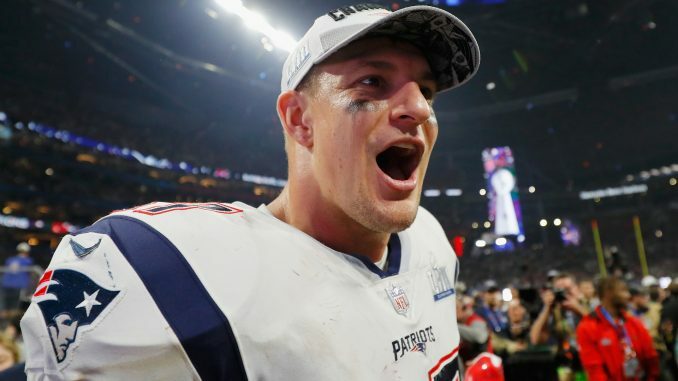 Throughout his interviews surrounding Super Bowl LIII, Gronkowski was not saying whether it would be his last game. As it turns out, his last time on the field was for the Patriots’ latest Super Bowl victory. Coaches around the league and Gronkowski’s own agent aren’t entirely convinced that he is done playing football. “I’ll believe it when I see it,” said Jets head coach, Adam Gase. “When he’s not out there, I’ll believe it.” Drew Rosenhaus, the tight end’s agent, could imagine a scenario in which Gronkowski would return to his former team. “If the team was struggling or they needed him at some point next year, and let’s just say hypothetically Tom Brady gave him a call and said ‘Rob, I need you.’ I wouldn’t be shocked if he came back to play a few games.” However, Rosenhaus also detailed some potential plans for his clients’ retirement saying, “Eventually we could see him doing TV, acting, a number of things. Appearances. Endorsements. He’s one of the biggest personalities. He won’t disappear.” While Gronkowski has expressed how thankful he is for his time in the league, he is now looking forward to the uncertainty of what’s next.